HANCEVILLE – There’s a new face on the Hanceville City Council. Jimmie Nuss was sworn in Thursday night, filling the seat left vacant by former councilwoman Sharon Porter, whose last meeting was two weeks ago. 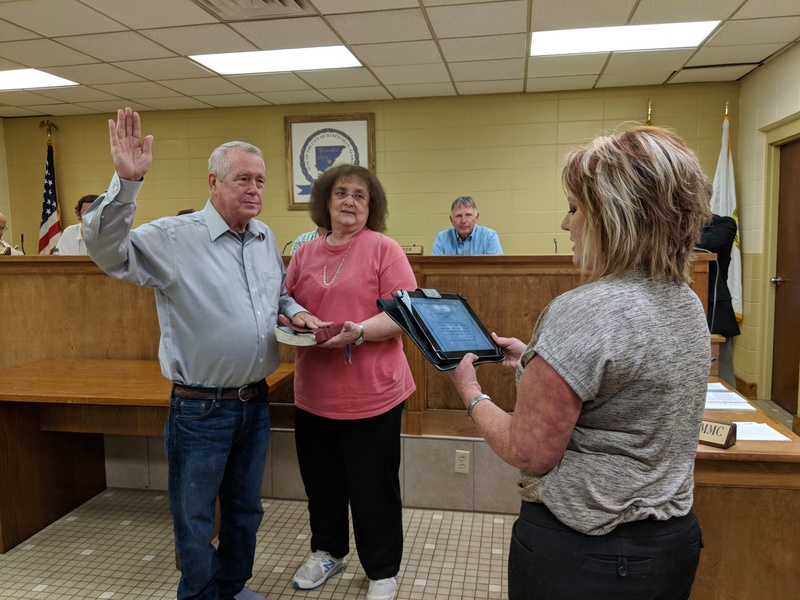 Nuss was nominated by Hanceville Mayor Kenneth Nail and unanimously approved by the council to serve the rest of Porter’s term, which ends in November 2020. Nuss, who is a longtime resident of the city and former councilman, has been active with the Boy Scouts, Lions Club, National Guard and Hanceville Fire and Rescue. Following the council’s approval, Nuss was sworn in immediately, after a quick check of the City’s handbook by City Attorney Dan Willingham and City Clerk Tania Wilcox to make sure they could do it so soon. Nail said of Nuss, "Let me say this about Jimmie Nuss, and I mean this from my heart: Jimmie Nuss is a man of his word. He's the guy that, if he thinks the mayor is wrong, he's gonna tell 'em. He's not a rubber stamp for anybody. He loves this town." Nail recalled the time he spent with Nuss while Nuss was recovering from injuries sustained during a fire department training exercise. "I stayed there in the hospital with him, spent the night in my car in the parking deck. We all thought he was gonna die. The day we brought him home, we brought him to the city limits and had all the firetrucks and police cars there to see him. We went by the school, and every school kid was out there hollering, waving cheering him on, 'Go Jimmie!' I've never been so proud of this town for coming out and supporting this man." The council also had several topics on its agenda that required a lot of deliberation. One was a possible incentive to get City employees to use other insurance providers in order to save the City money. After calculating roughly how much the City spends on insurance for its employees, the council tossed around the idea to give a stipend to employees who proved that they receive credible coverage from a different provider. The council made it clear that all City employees must have insurance, so anyone who either cannot get outside coverage or gets it but loses it will still be covered by the City, but they will not receive the incentive stipend. The topic was tabled until the council could do more research and get more concrete numbers. Another big topic for discussion was what to do with the Rayford Talley building, which is currently being used to host fitness classes. The City allowed someone to use the building free of charge, and the council said that person subleased the building. The council deliberated whether the City would want to rent the building out, and if so, how much rent could be charged. It decided to also table the topic until the person originally using the building clears out. introduced Ordinance No. 621, which will amend Zoning Ordinance No. 510. The public hearing for Ordinance 621 will be during the next work session on Aug. 23 at 6 p.m.
discussed the paving of County Road 662. The City of Cullman agreed to pave it if Hanceville would purchase the materials, so the council agreed to work that project into the next budget. No other action was taken. paid the invoice to Action Resources and cleared up the protocol to be followed when demolishing a home. A home inspection must check the property for asbestos if the city is performing the demolition, and appropriate action will be taken based on the results. However, a homeowner can demolish their own property without an inspection. Previous articleStudents from Vinemont High InSPIRESS team travel to Washington, D.C.